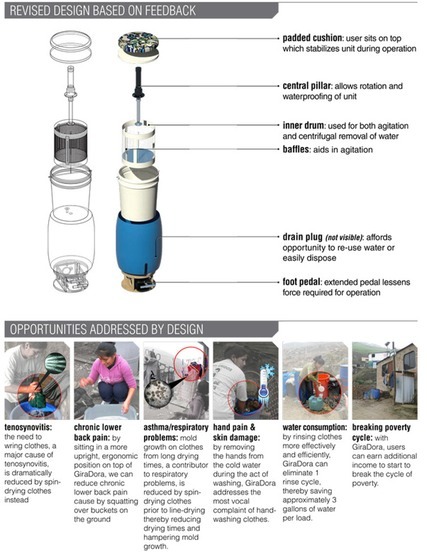 GiraDora is a patent-pending human-powered washer and spin dryer to increase the efficiency and improve the experience of hand-washing clothes. The user sits on top of the drum-like appliance and pumps a pedal with her foot, which agitates, cleans, rinses, then spins-dries clothes. 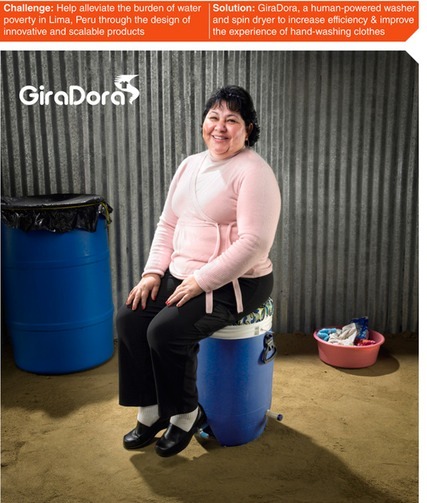 While providing a more comfortable, ergonomic, and efficient way to clean clothes, GiraDora also affords opportunities to generate income. For under $40, GiraDora more than doubles productivity, increases health of women and children, and affords the opportunity to begin breaking the poverty cycle. See also Balde a Balde pump. The video below shows GiraDora in action in Peru. In the developed world, we forget that there was once a time when washday meant “day” rather than “toss it in the machine and come back in 20 minutes.” In many parts of the world without access to electricity and clean water, that time is still now. Design students Alex Cabunoc and Ji A You of the Art Center College of Design in Los Angeles visited the the slums of Cerro Verde, Peru. There they saw women spending days on end hauling water and washing clothes by hand and they came up with a solution. 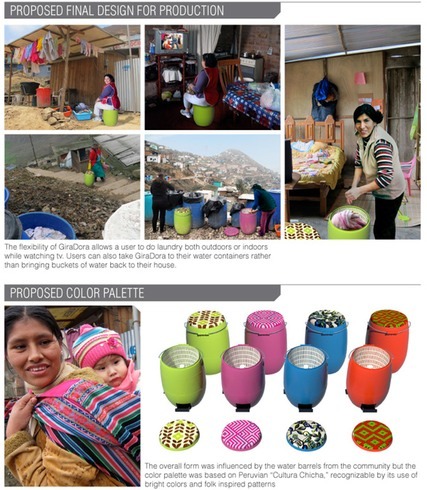 They created the GiraDora, a foot-pedal washing machine that’s inexpensive and portable. Cabunoc and You were in Cerra Verde as part of the Safe Agua Peru program. The purpose of the visit was to come up with ways to help locals deal with water-related problems. There, women had to trek miles to collect water and haul it home by the bucket load before washing their clothes one piece of a time. This can take up to six hours and needs to be done as many as five times a week, outside and in all weather with hands constantly plunged in basins of cold, soapy water. Clothes can take as long as three weeks to dry in the winter and often end up rotting and mildewed. GiraDora is Cabunoc and You’s solution. Human-powered washing machines are not a new idea, but the challenge here was to design a one that's cheap, portable and easy to use, yet gets the clothes clean and relatively dry. After working with models based on sink plungers, salad spinners and the like, the pair came up with what looks like a picnic cooler crossed with a top-loading washing machine. Mechanically, it’s really very simple, which isn’t surprising because the final design was developed on the spot back in Cerro Verde. GiraDora is a plastic tub tall enough to sit on. In fact, it’s designed to be operated while sitting on it to keep it stable. Inside, there’s a second tub like that in a conventional washer mounted on a center post. The post is connected to a pedal on the base of the tub. The machine is filled with clothes, water and soap and the lid put back. The operator then sits on the tub and repeatedly presses down on the pedal with her foot. This works the mechanism that agitates, cleans and rinses the clothes. When the clothes are clean, a stopcock in the base is opened and the pedal worked again. Now the washer becomes a spin drier and the clothes can be hung up to complete drying in a reasonable time. The cost of the machine is about US$40. The benefits of the GiraDora go beyond turning laundry from a ghastly ordeal into a simple chore. The GiraDora is self-contained and requires no electricity. Not only is the GiraDora much more efficient than hand washing and saves many hours of time, it’s more comfortable to use and less wearing on the back, arms and hands. The foot pedal also leaves the operator’s hands free for other activities. Whole loads can be washed at once and it can be carried to the water source or used indoors in bad weather. The spin dry function improves the health of the family, especially children, by reducing exposure to mold and mildew. In addition, the machine is a chance for women to make money because the time saved doing the family’s clothes means that they can take in other people’s washing. Cabunoc and You have presented the device at several conferences and were awarded an NCIIA E-Team grant of $19,500 to help in bringing it to market. They hope to complete field testing in Peru in a year with 50 machines and begin selling them in South America within three years before moving on to India. Their final goal is to have one million users of the machines.